Exports during April,2016 were valued at US$ 20568.85 million (Rs.136720.11 crore) which was 6.74 per cent lower in Dollar terms (1.21 per cent lower in Rupee terms) than the level of US$ 22054.72 million (Rs.138400.44crore) during April, 2015. Non-petroleum exports in April 2016 are valued at US$ 18589.27 million against US$ 19299.56 million in April 2015, a reduction of 3.68 per cent. The trend of falling exports is in tandem with other major world economies. The growth in exports have fallen for USA (3.87 per cent), European Union (0.04 per cent), China (25.34 per cent) and Japan (1.10 per cent) for February 2016 over the corresponding period of previous year as per WTO statistics. 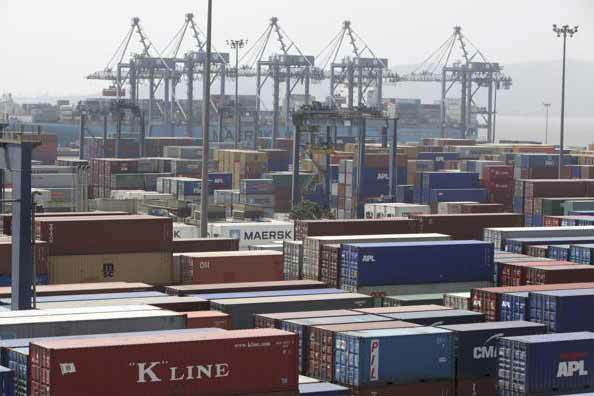 Imports during April, 2016 were valued at US$ 25413.72 million (Rs.168923.71 crore) which was 23.10 per cent lower in Dollar terms and 18.54 per cent lower in Rupee terms over the level of imports valued at US$ 33047.02 million (Rs.207380.63 crore) in April, 2015. Oil imports during April, 2016 were valued at US$ 5655.92 million which was 24.01 per cent lower than oil imports valued at 7442.92 US$ million in the corresponding period last year. Non-oil imports during April, 2016 were estimated at US$ 19757.80 million which was 22.83 per cent lower than non-oil imports of US$ 25604.10 million in April, 2015. Exports during March, 2016 were valued at US$ 12895 Million (Rs. 86424.74 crore). During March, 2016, on month-on-month basis, growth in services export turned positive (with a growth of 4.59 per cent) as compared to negative growth (1.94 per cent) during February 2016 (as per RBI’s Press Release for the respective months). Imports during March, 2016 were valued at US$ 7905 million (Rs. 52980.81 crore). MERCHANDISE: The trade deficit for April 2016 was estimated at US $ 4844.87 million which is lower than the deficit of US $ 10992.30 million during April 2015. SERVICES: As per RBI’s Press Release dated 13th May 2016, the trade balance in Services (i.e. net export of Services) for March, 2016 was estimated at US$ 4990 million. The net export of services for April- March, 2015-16 was estimated at US$ 69590.21 million which is lower than net export of services of US$ 76587.55 million during April- March, 2014-15. (The data for April- March 2015-16 has been derived by adding April-December 2015-16 with month wise QE data of RBI Press Release dated 13th May 2016). OVERALL TRADE BALANCE: Taking merchandise and services together, overall trade deficit for April- March, 2015-16 was estimated at US$ 48869.16 million which is 20.03 percent lower in Dollar terms than the level of US$ 61107.40 million during April – March 2014-15.